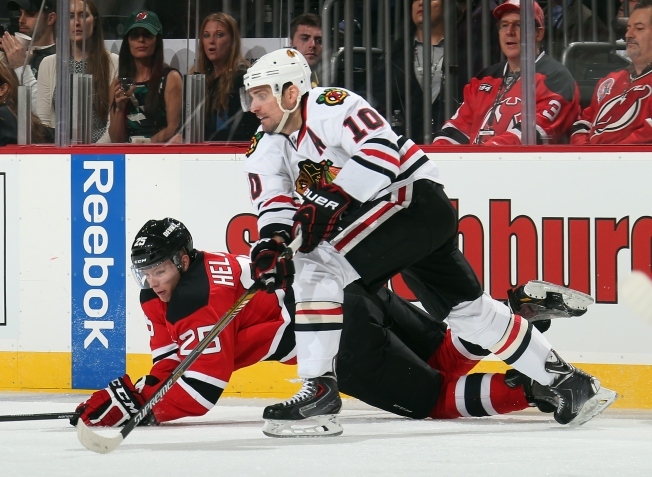 Patrick Sharp #10 of the Chicago Blackhawks and Seth Helgeson #25 of the New Jersey Devils reach for the puck during the second period at the Prudential Center on December 9, 2014 in Newark, New Jersey. The Chicago Blackhawks kept up their winning ways on Tuesday night as they got shootout goals from Patrick Kane and Jonathan Toews in a 3-2 win over the New Jersey Devils. We’ll have plenty of reaction to this game, as well as coverage of the Hawks’ upcoming battle with the Boston Bruins, throughout the day, but before we get into that, here are our Three Stars of the game. Darling was only required to make 22 saves in the Blackhawks’ victory, but the reason we’re including him on this list isn’t because of the limited work he did during the game, but because of what those saves represented. The Devils’ first goal of the evening came courtesy of Jordin Tootoo, who scored on a seeing eye shot from the face-off circle that Darling overcommitted to on the near post. The shot curled just inside the far post to put the Devils up 1-0, and it was an admittedly soft goal to give up. Just like Corey Crawford has done so many times in recent years, Darling really buckled down after that mistake and had himself a really good evening. He was at his best in the shootout, stopping both Martin Havlat and Jaromir Jagr on their attempts. That enabled Toews and Kane to do their thing, and the Hawks got a win as a result. The Blackhawks are one of the most aggressive teams in the league when it comes to pinching in their defensemen on offensive possessions, and Keith proved Tuesday night that it can pay to be aggressive when he scored the game-tying goal with just three minutes left in regulation. After Brent Seabrook had made a great play to keep the puck in the zone earlier in the sequence, Keith was up near the blue line reading the play. Seeing that the Devils had over-rotated their defense to the middle and far sides of the ice, Keith quickly made a break toward the net. When Marian Hossa’s shot was stopped by Devils goaltender Kevin Kinkaid, Keith was right there to collect the rebound and ripped a one-timer into the back of the net to tie things up at 2-2. It was a very nice read by the two-time Norris Trophy winner, and one that the Blackhawks desperately needed him to make. There was an element of luck to the puck finding him so perfectly, but Keith really made it for himself as he skated into a position to succeed. In his first game back with the Blackhawks after missing 14 contests due to injury, Sharp immediately tried to make an offensive impact on the team, picking up an assist and firing five shots on goal in the 3-2 victory. Sharp’s biggest contribution didn’t come on the offensive side of the puck however. In the second period with the Hawks’ trailing by one, the Devils were trying to bring the puck into the offensive zone, and Sharp made a great play to chip the puck over to the boards. The Devils were already into the offensive zone when he did it, setting up a 3-on-1 rush the other way. Sharp got the puck to Bryan Bickell, and Bickell got the puck into the net as the Hawks tied the game at 1-1. Playing primarily on the top line with Marian Hossa and Jonathan Toews this season, Sharp has shown that he can hang with the big boys when it comes to utilizing an aggressive back-check, and on Tuesday he proved that 14 games off didn’t dampen his enthusiasm for doing so. It was a great play by a veteran player, and it was arguably the most impressive thing he did all night.